Every now and then a CD comes along that makes you glad to be alive: the music is so infectious and the performances brilliant! 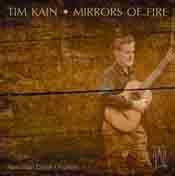 This is one such CD, featuring Timothy Kain, Australia's virtuoso guitarist. He has commissioned all the solo works included here, except Westlake's Hinchinbrook Riffs which was commissioned by Tall Poppies with assistance from the Australia Council. All the solo works receive their world premiere recording on this CD. Westlake's concerto, Antarctica Suite, was written for John Williams, and this performance features Kain with the Tasmanian Symphony Orchestra conducted by David Porcelijn. Australian guitarist Timothy Kain is perhaps best known as John Williams's duet partner (see The Mantis and the Moon in July/Aug 1997). Of course, to become John Williams's duet partner one has to be a superb guitarist, and Kain is certainly that. His technique is excellent, his tone is robust, and his interpretations are vivid and gripping. He is, in fact, a much more extroverted player than Williams, not worried about pushing his instrument if the situation demands and willing to stick his neck out for a bold interpretive choice. In addition to his considerable activities as a solo and chamber performer, he has also devoted much energy to enlarging the guitar's repertory with works by his fellow Australians, as the present release attests. These works, with only one exception, were all written or arranged for Kain. The exception is Nigel Westlake's Antarctica, the most ambitious piece here – a four-movement, 22-minute work for guitar and orchestra adapted from an IMAX film score that Westlake wrote and dedicated to John Williams and John Weiley (the latter is the filmmaker). The work is riveting from start to finish, with bold gestures, extreme dynamics, and compelling interaction between soloist and orchestra. Westlake's other work here, Hinchinbrook Riffs is much more modest, a hypnotic piece for guitar and digital delay (a "tape loop" effect used by electric guitarists). The title piece of the record, Richard Vella's Mirrors of Fire, is also repetitive and hypnotic, though much more sinister than Westlake's piece: it is underpinned by a menacing bass ostinato that relentlessly traces out octatonic scale fragments (the octatonic scale is made up entirely of alternating whole and half steps – a favorite of Stravinsky, Bartok, and Debussy). The two Blackwattle Caprices by Ross Edwards that open the program are endearing miniatures, mostly tonal but with some nice biting dissonances. (The works are named after the bay the composer lives on.) Graham Koehne's Closed World of Fine Feelings shows the influence of his teacher Virgil Thomson in its tonal simplicity and expressive directness. The next two works, Richard Chariton's Surface Tension and Robert Davidson's Junction Rd are also unself-consciously tonal, both composers creating interest through bold rhythmic gestures and virtuoso flourishes. Martin Wesley-Smith's Kolele Mai is a primitive, somewhat brutish meditation on an East Timorese folk song. Kain plays its insistent power chords with a sense of dark portent. The sound is transparent and natural; Kain's two Smallman guitars – instruments that sound great in person but often come off strangely rubbery on records – sound full-bodied and rich. The notes include comments from the composers on their works and brief remarks from Kain himself. As I once remarked while reviewing some other recordings of 20th century guitar music, some renowned guitarists, such as Andrès Segovia, Julian Bream and John Williams, bravely encouraged composers to write new works at a time when the instrument was largely neglected. That resulted in an imposing series of very fine works that have been taken up by other guitarists since and of which some have become 20th century classics. Tim Kain is one such guitarist who has inspired present-day Australian composers to write works for him. That said, the most substantial work here, Antarctica for guitar and orchestra, was written by Nigel Westlake for John Williams who recorded it some time ago (From Australia – Sony SK 53361). Actually, Westlake has the lion’s share in this selection which also includes his Hinchinbrook Riffs for guitar and digital delay. Antarctica re-works material from the substantial film score that Westlake composed for the eponymous film. Incidentally, the film score is available on Tall Poppies TP 012; I have not heard this disc. The suite is in four movements: The Last Place on Earth (presumably the film’s main title, an impressive piece of music, anyway), Wooden Ships (a beautifully atmospheric miniature tone poem), Penguin Ballet (a lively Scherzo with some menacing undertones suggesting the presence of predators, in this case, leopard seals) and a long bipartite Finale The Ice Core/Finale. The first, somewhat bleaker part of the last movement, deals with the hole in the ozone layer and the potential danger it presents. The lively, jig-like Finale proper alludes to the signing of the so-called Antarctic treaty. Hinchinbrook Riffs is, so it seems, a recent reworking of an earlier similarly titled piece for guitar and digital delay. Do not be put off by that intriguing New Tech phrase, for this piece is very attractive indeed, on the whole a bit minimalist. Digital delay is used quite discreetly, but very efficiently throughout the piece creating unexpected melodic echo-like effects and interesting rhythms as well as suggesting an element of counterpoint. The other pieces are all for solo guitar, and make for a very enjoyable, varied and contrasted collection. Most are fairly straightforward, i.e. as far as the listener is concerned, for I suspect that they may be rather tricky to play. Edwards’ Blackwattle Caprices are just that, viz. a song-like fantasy and a capricious dance. The pieces by Graeme Koehne, Richard Charlton, Robert Davidson and Richard Vella are elegant, well-made studies of great charm and appeal. Wesley-Smith’s Kolele Mai (one of the longest single items here) is based on an East Timorese folk-song that, with new words fitted into it in 1975, has become a song of resistance during the long years of colonial occupation. This work written for Tim Kain is a substantial and attractive free fantasy. Tim Kain, whose name – I am ashamed to say – was new to me, plays marvellously throughout. He obviously loves the music and relishes every minute of it. The recorded sound is fine, and the production excellent although I would have welcomed more information concerning the composers and their works (e.g. dates of birth and of composition). This is a very enjoyable and commendable selection of accessible 20th century music for guitar. I recommend it wholeheartedly. The release of a CD completely dedicated to Australian guitar music is a rare event indeed. When the CD also contains music of a consistently high quality matched by musically flawless playing it is also a most enjoyable event. From the opening notes the striking recorded sound is instantly captivating, offering a natural tonal palette which captures the timbrel richness of the Kain / Smallman combo to great effect. The unique sound and musical possibilities offered by the Smallman guitar are fully exploited and sensitively applied by the performer. The program opens with Ross Edwards’s Blackwattle Caprices, which, like many compositions on the CD, was commissioned by Tim Kain. The light and buoyant ‘Maninya’ style of Ross Edwards, with its life-affirming qualities, is captured with both a pinpoint rhythmic precision and a rhapsodic melodic style of playing. The continuously changing metre is seamlessly bound together into an organic whole. Tim Kain’s use of subtle but effective glissandi ensures melodic fluency and expressive phrasing are always at the fore. With the work by Graham Koehne we are offered an enigmatic portrait of a "wonderfully sensitive and somewhat introverted individual". A Closed World of Fine Feelings achieves its musical goal and Kain brings to life an evocative and sensitive sound portrait. Richard Charlton’s Surface Tension is another highly effective piece by one of Australia’s most accomplished composers of guitar music. Charlton’s use of linking thematic ideas creates a satisfying musical whole, as the opening passage of the toccata reappears as the ground of the closing passacaglia. Charlton will be the featured composer at the 6th Darwin International Guitar Festival in July ’05. The folk-like feeling of the Robert Davidson work Junction Road is a wonderful example of a composition that can so effectively bring together the worlds of the popular and the classical until defining limits becomes pleasingly impossible. The composer’s style seems to grow out of an effective amalgam of an eclectic range of musical styles in which the composer is always fluent and at home. We are drawn seductively into a welcome world beyond postmodernism. In Kolele Mai Martin Wesley Smith juxtaposes driving, rock inspired ‘power chord’ like progressions with wistful melodic passages drawn from the popular East Timorese folk-song of the same name adopted by the independence movement. The manner in which Tim Kain drives the opening chords makes one wonder if he indeed once lived a somewhat different life. The dramatic contrapuntal passages that punctuate the work are deftly handled and perfectly integrated into the structure. From its opening notes, Vella’s Mirrors of Fire takes us on a musical roller coaster ride, ever driving forwards as it progressively reveals the kaleidoscope of motives, which have come along for the journey on the "relentless walking bass line". Nigel Westlake is well represented with both a work drawn from a collection of youthful jottings and by one of the masterpieces of the contemporary concerto repertoire, the Antarctica Suite. Hinchinbrook Riffs makes use of a half-second delay, where the performer is shadowed by his own live performance, creating mesmeric ‘wave like’ effects. The precise control required to create the effective interplay of the parts Kain delivers in abundance. The concerto, now well known to audiences, makes a welcome reappearance. The beautifully considered and somewhat understated performance of Wooden Ships is one of the highlights of the CD. Kain has the special ability to allow the music free reign while never becoming personally detached, seeming to create a whole greater than the parts. The stylistic balance of the works on the CD has been carefully considered to good musical effect with each work complementing the ones around it. After the intense ostinato-driven Vella work Mirrors of Fire, the dreamlike Hinchinbrook Riffs offers the perfect salve. A CD that repays repeated listening, each one revealing deeper levels of musical meaning. Tim Kain’s sensitive and intuitive playing allows the true depth and beauty of the works to be revealed while still maintaining a musical freshness. The liner notes are well presented and informative. The introductions by the composers are a welcome addition. I have to agree with Tim Kain that "Australia is blessed with a lot of bloody good composers" – and, fortunately, players to match. A tour de force, I hope this important CD reaches the wide audience it deserves. Adrian Walter is Head of the School of Creative Arts and Humanities, Charles Darwin University and a Senior Lecturer in Guitar and Music History. In 1993 he formed the Darwin International Guitar Festival, of which he is the Artistic Director. The major piece on this disc is not the title track but Nigel Westlake's Antarctica. It is a substantial re-working of music originally composed for an Imax film about the frozen continent and the movement titles still reflect its origins. Westlake calls it a 'suite for guitar and orchestra' -- that is, not quite a concerto -- but the distinction does not seem terribly important. The soloist's role might perhaps be interpreted for programmatic reasons as the voice of mankind in a spectacular but indifferent environment, but that is at least analogous to the solo-orchestra opposition of a concerto [listen -- track 9, 1:13-2:08]. The Tasmanian Symphony is one of the smallest of Australia's State orchestras but has a well-earned national reputation for excellence. It is hard to imagine a better realisation of the score than they give us here under David Porcelijn. Colours are vivid, rhythms are precise, and the orchestra changes direction on the point of an icicle [listen -- track 11, 1:22-2:33]. Antarctica is a very attractive work in its final form but betrays its origins as programme music in that some transitions lack apparent musical logic. It is not a major fault, but if it troubles the listener there are always the alternatives of listening to the film version (a previous Tall Poppies release) or perhaps even seeing the film. Before the orchestra arrives we are treated to a substantial solo recital. All of the items were commissioned by Kain and all of them are world première recordings. To present seven new pieces from as many Australian composers is a respectable achievement, but the quality and diversity evident here takes Kain's achievement from 'respectable' to 'impressive'. The title track is by Richard Vella. Irresistibly propelled by its walking bass, Mirrors of Fire is a driving, dramatic piece which never loses its superbly focused energy [listen -- track 7, 0:00-1:00]. Wesley-Smith's piece is more spacious than most at over eight minutes and has a political programme, as his music so often does. Kolele Mai, based on a Timorese resistance song, opens ominously but satisfyingly works through, and resolves, its tensions [listen -- track 6, 0:00-1:10]. Ross Edwards' Blackwattle Caprices are a slow-fast pair, song and dance respectively. Edwards himself prefers the term 'maninya' to 'dance', explaining that maninyas are dance-chants; it's an aboriginal word that is gradually acquiring a meaning to listeners through his regular use of it[listen -- track 2, 0:00-1:23]. The remaining solo items are equally individual. Graeme Koehne is perhaps most widely known for To His servant Bach, God grants a final glimpse and the musical portrait which is his contribution to Mirrors has a formality which also suggests baroque influences. Charlton gives us a toccata-like introduction followed by an allegro and a passacaglia, all closely related and all over in less than five minutes, while Davidson contributes an impressionistic ramble along Brisbane's Junction Road. Finally, Hinchinbrook Riffs ripples along beautifully with the help of a delay unit, evoking the constantly changing patterns of sand, waves and clouds of this tropical island wilderness. Kain's playing is marvellous. He is completely at ease with every technical demand and every idiom, and brings out the individuality of each piece with a story-teller's supple control of pace and emphasis. This is, I think, the first time I've been the least bit disappointed by a Tall Poppies disc. I'm annoyed with myself for being disappointed because I know I'm being unreasonable, but I can't help it. My problem is that Mirrors of Fire feels so much like half of a double-CD set and I want the other half. If we had another work with orchestra and a few more solo items, I needn't suffer the jolt of an orchestra arriving in my living room mid-way through an intimate recital. And I could, very happily, listen to Tim Kain for another hour.